Ospreys scored two tries in the final two minutes to secure two bonus points in their European Champions Cup defeat at Clermont Auvergne. The home side opened a commanding 20-3 half-time lead with tries from David Strettle and Aurelien Rougerie. Tries from Justin Tipuric and Eli Walker put Ospreys back in contention, before Strettle and Wesley Fofana scored to take Clermont clear again. But Ospreys salvaged bonus points when Sam Parry and Tom Habberfield crossed. Habberfield's try was a spectacular length of the field effort in the final play of the game from the re-start following Parry's score two minutes from time. And the two bonus points mean Ospreys return to the top of Pool 2 with six points from two games, with Exeter and Clermont - playing their first game after their opening game was postponed after the Paris attacks - level on five points. The late drama - that saw 19 points scored in the final four minutes - was a fitting end to an engrossing game of skilful and incisive attacking play. Strettle, who pulled out of England's extended World Cup squad in favour of moving to France over the summer, exploited a loss of defensive concentration to score the first try with relative ease. An aimless clearance kick went straight to full-back Nick Abendanon, and his quick pass found Strettle in acres of space with only Ospreys full-back Dan Evans to beat. The England winger did that with an audacious side step that sent Evans sprawling. Camille Lopez, whose earlier penalty had cancelled out Dan Biggar's drop-goal, added the conversion and the French tails were up. If the first try was down to individual brilliance, the second was an example of exemplary team work. Superb link-up play outmanoeuvred the visitors and the flowing move ended with centre Rougerie cantering over from a few yards after a perfectly timed Lopez pass. 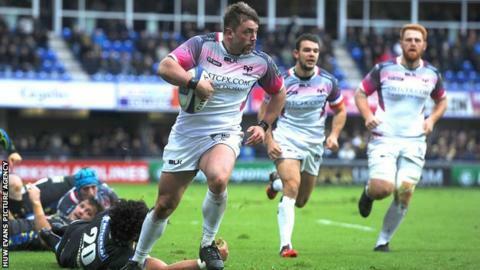 The break came at the right time for Ospreys and they turned the game on its head in the opening minutes after the restart. Prop Dmitri Arhip was a blade of grass short of grounding the ball on the tryline, but Ospreys maintained field position and a driving maul ended with Tipuric going over. Walker's piece of opportunism two minutes later resulted in the second score when he pounced on Noa Nakaitaci's hesitancy to ground a loose ball after Tipuric's kick ahead. Biggar's superb conversion from the right cut the deficit to 20-17 and the momentum had shifted entirely. But Clermont, who have not lost a home European game since 2008, showed all their pedigree to wrestle the game back in their favour as Strettle displayed more classy footwork to score his second. A crossfield kick from effective replacement Brock James then allowed Fofana to score Clermont's fourth try that secured a bonus point and seemed to settle the game as a contest, making it 34-17 with four minutes remaining. But Ospreys, down to 14 men after a yellow card for Sam Davies, persevered and they were rewarded when Parry ran in unopposed before Habberfield scored a contender for try of the season that secured a losing bonus point and another bonus point for scoring four tries. Clermont wing and man-of-the-match David Strettle: "It seemed very good until the very end. "We're kicking ourselves a bit because there was a few errors in the game. "We thought we'd obviously managed to stop them going away with a bonus point, but you know credit to them, they played until the end and even though we knew what they were going to do we still couldn't stop it. "A win is a win and we've got to be happy with that, but we've got to move on to the next game now and back it up." Ospreys forwards coach Chris Gibbes: "I think it's definitely a good result. "That's what we came here to do was score four tries and see where that led us, and we're just really happy with the effort the boys put in. "For them to have the courage to play from their own line like that sort of sums up the night really. "We knew we had to go 12 rounds with this team and the boys stuck to it and we're just incredibly proud to come away with two points." Clermont Auvergne: Abendanon; Strettle, Rougerie, Fofana, Nakaitaci; Lopez, Parra, Domingo, Kayser, Zirakashvili, Cudmore, Vahaamahina, Chouly, Lapandry, Lee. Replacements: Vulivuli for Nakaitaci (72), James for Lopez (58), Radosavljevic for Parra (76), Chaume for Domingo (62), Kotze for Zirakashvili (62), Van der Merwe for Vahaamahina (54). Not Used: Van der Westhuizen, Kolelishvili. Ospreys: D. Evans; Grabham, Spratt, Matavesi, Walker; Biggar, Leonard, James, Baldwin, Arhip, Ashley, Jones, Lydiate, Tipuric, King. Replacements: Davies for Grabham (68), Habberfield for Leonard (59), Bevington for James (72), Parry for Baldwin (47), Baker for King (62). Not Used: Jarvis, Thornton, Dirkson.